What's not to enjoy? 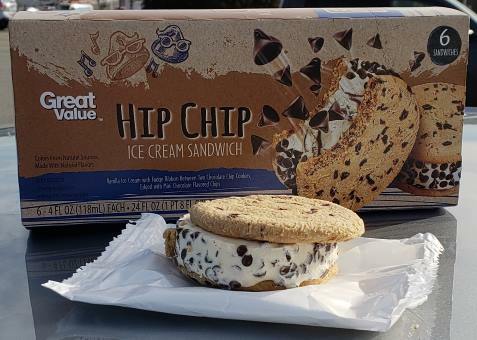 Two big cookies, ice cream, lots of little chips. Let's be honest, it's pretty hard to mess up. I'll just make one note for these. I wasn't sure what to expect from the fudge ribbons (aka I forgot about them) but they are actually pretty cool to look at. They don't go through the whole treat for some reason, but I think that's for the best. The fudge is probably my least favorite part of this treat, so the bites that have a ton of fudge aren't as good as the other bites. So, this is a budget treat that could use a bit more flavor in the ice cream part, but it's a tasty budget treat and I doubt you would regret buying them. I know I don't. Ok, back to the hunt! Yeah, I've passed by them a million times but I don't bring them home since they are cross contaminated. They all look tasty enough and I agree it's nice that the filling is an upgrade from frozen dairy dessert. 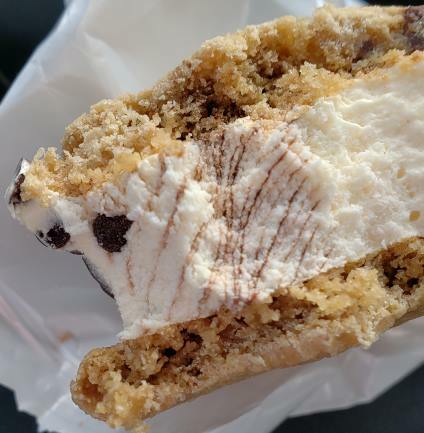 Still can't top the Chipwich for me. I think that is prob the best ice cream cookie out there at the moment. Just hard to find for most people.